What are Grand National Odds and Who decides them? Betting Tips here! Watching horses race against each other is a spectacle in itself, but as we all know betting and odds also play a huge role in the sport of horse racing. Betting on horse racing is the originator when it comes to having a view and backing that up by putting your hard-earned cash down. This has always been the leader where Grand National Odds came from. Horse racing punters and bookmakers have been around for hundreds of years. But with the digital age now in full swing, times the way people place bets has certainly changed dramatically. Around 25 or 30 years ago, the only way to place a bet would’ve been at the racecourse itself, or a high street bookmaker. Yes, you can still do both, but with the explosion of the internet and mobile phones then the bulk of horse racing and sports bets these days are placed using a digital device. How Are The Grand National Odds For Each Horse Decided? There are a few factors that decide the prices on each Grand National horse. But in the build-up, most bookmakers will have similar prices on each horse. Before the final runners are declared (2 days before the race) the bookmakers will have what’s called an ‘ante-post’ market. This is filled with all the horses that the bookmakers think ‘might’ run in the Grand National. Due to safety reasons, the maximum number of runners in the Grand National is 40. So there will be a lot of priced-up horses that won’t actually make it – more on ‘ante-post’ betting below. Each bookmaker will be competing for business by offering competitive Grand National odds to attract customers. It’s no different than going shopping. Why pay £50 for trainers you can get for £45 further down the high street! However, that doesn’t mean bookmakers can just pluck odds out of the air. Due to a horse being well-supported (a lot of money placed on it) their hands might be forced. They have to offer lower Grand National odds in their ante-post Grand National market than a rival. In simple terms – the more money placed on an individual horse then the shorter their odds will become. While the opposite to this is that if there is no interest in a certain horse the odds for that runner may well increase. The bookmakers look to attract punters to place a bet with them. Each betting market – whether it’s a horse racing one or not – has to operate with what’s called an ‘over-round’ percentage. This is how the bookmakers make money on each event – more on that below. The traditional ‘rails bookmakers’ are the ones you see at the track. Generally, they’re lined up in rows in front of the grandstand at each track. Sometimes referred to as the ‘betting jungle’ this can be a daunting way to bet for novice racegoers. Around a big meeting like the Grand National, this can be a busy, noisy and confusing place to bet. Grand National odds can change quickly as each bookmaker competes for business. They also alter their position on each race and horse. If a flood of money comes in for a particular horse then they have to shorten the odds. If you are prepared with the number of your horse and your stake, try betting with the rails bookmakers. They are ‘old school’ horse racing people and it’s all part of the experience. This is when bookmakers offer a market for a future event – like the Grand National. This means that all-year-round punters have the opportunity to place bets on the big horses races through the year. Horses might improve, or impress in a certain trial race. Which will encourage people to want to back them in a future race. This is still a gamble though as not all horses that are in ante-post markets actually run. Unless your bookmaker has a money-back offer ‘non-runner, no bet’ then you would lose your money here. The conundrum for punters is always to be tempted with bigger ante-post odds. Bookmakers know that if a horse doesn’t run, they will win on that bet before the race has even run! 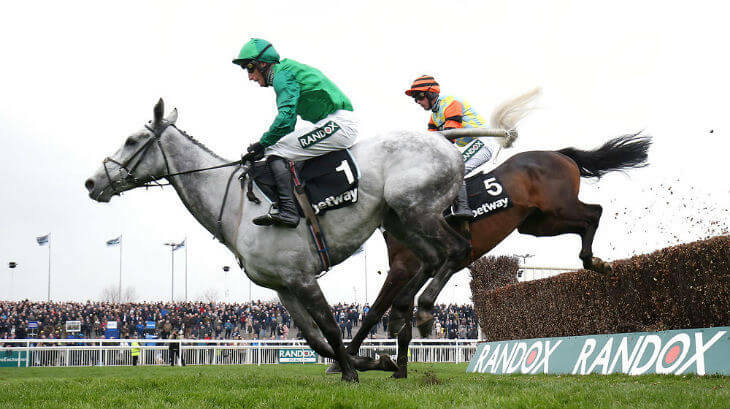 For the best Ante-post betting odds and tips, see our Grand National Ante post Outlook for 2020. Why Do Grand National Odds Change? Every betting market for a bookmaker has to have what’s called an ‘over-round’ percentage. In simple terms, this is how the bookies make their money. If the market percentage is 100%, based on the odds on all the runners, the bookmaker should break-even on that event. Anything under 100% means you could back EVERY horse in that race and make a small profit. With there being more and more bookmakers around, there’s a lot more competition. Finding races that are under 100% is not as hard as they used to be – generally smaller fields. Anything over 100% and this is the potential profit that bookmaker can make on that race. They need to make money, but also keep their prices competitive. If the over-round is 120%, the bookmaker would expect to pay out £100 for every £120 he takes in on bets – this is how they make money. In the build-up to the Grand National, you can shop around with different bookmakers offering different odds. Why take 10/1 if you can get 12/1 on the same horse with a different bookmaker? If you are placing £10, that would be a difference of £20 with winnings of £120 (12/1) instead of £100 (10/1). When the race gets to around 10-15 mins before the off time, the betting market will go into what’s called the ‘LIVE SHOW’. This means the hoses will have the same prices across all the bookmakers. Not every horse will be 10/1. But what it means is that you’ll no longer be allowed to shop around for value. If a horse is 10/1 on the live show, it will be 10/1 with all the bookmakers in the country! Then, if that horse gets backed on the track then it might shorten to 8/1. A price that will be universal across all bookmakers and in all high street bookmakers in the UK. This way each horse will have it’s own SP (starting price). Then when you see the horse racing results page in your papers (or online) after the race, they will all have the same odds across different publications. If you’ve managed to take 12/1 earlier in the day, or a week before, the bookmaker will have to honour that price. Tip – Look out for bookmakers offering ‘BEST ODDS / GUARANTEED ODDS’. This is a great safety net. If you take a price and it drifts to a bigger one, that bookmaker will still pay you out at the bigger price. Take 8/1, if the horse wins at 10/1 you’ll be paid out at 10/1 (if you’ve placed a bet with a BIG bookie). A lot can happen in the build-up to the Grand National. But the betting market really comes to life in the morning of the race, and in the hour/minutes before the race. Things like the weather can play a huge part. Certain horses might not like soft ground. So, even though it might have been well-fancied in the build-up, if the Liverpool track is covered in rain on the day of the Grand National then all of a sudden this is a huge factor against that horse. This may result in their odds drifting, while the opposite to this might be a horse that likes soft ground and their odds getting shorter as punters latch onto this. An example of this would be the 1998 Grand National when the Nigel Twiston-Davies runner – Earth Summit was backed into 7/1 favourite after being on offer at 20/1+ in the morning after a deluge of rain. It was no secret the horse loved the soft ground and whereas that also hindered a lot of the others punters rushed to back him which resulted in his Grand National odds tumbling from 20/1+ to 7/1. The backers were right after he won the race and the bookies were still paying out the next day! The 2017 Grand National winner – One For Arthur – was pretty steady through the day and morning at around 20/1 to 12/1 and eventually won at 14/1. Blaklion, who was well-fancied for the 2017 & 2018 Grand Nationals – was the one punters latched onto after backing him into 8/1 favourite. He didn’t win in 2017, but having finished fourth then the bookmakers would still have had to pay out on the each-way part of any bets. Other key factors to look for with rewards to Grand National odds potentially getting shorter are key trainers or jockeys. Previous winning stables or jockeys are always of interest, while the main jockeys like Ruby Walsh and Barry Geraghty will always have their supporters no matter who they are riding. Horses that have run well in the race before are also worth looking for in the betting. Red Rum was the last horse to win back-to-back Grand Nationals. But in recent years horses that have run well in the race before (placed) have done so again. Recent examples of this are Saint Are, who was 2nd in 2015 and 3rd in 2017, while a horse called State Of Play was 4th in 2009 and 3rd in 2010. Don’t forget that with the Grand National being the biggest betting race of the year then the ‘once-a-year’ punters will also be out in force. This means if they remembered a horse from last year or backed a horse that did well from last year and it’s running again – there is every chance they will side with it again!